ItemB-09381 - The Clarence Hotel, Stelly Block and Argyle House, Victoria. ItemB-01670 - Cliff House, Victoria. ItemB-04317 - The dining room of the Driard House, Victoria. ItemB-09370 - "British Columbia, the Victoria Theatre and New Driard Hotel." ItemD-08752 - The three Earle sisters, Lizzie, Ethel and Nellie. ItemB-04059 - Wreck of an E & N Railway train. ItemF-02629 - A Blackfoot camp near Banff. ItemB-06308 - Dr. and Mrs. Thomas Crosby and their five children; at the Port Simpson mission house. Item D-08752 - The three Earle sisters, Lizzie, Ethel and Nellie. 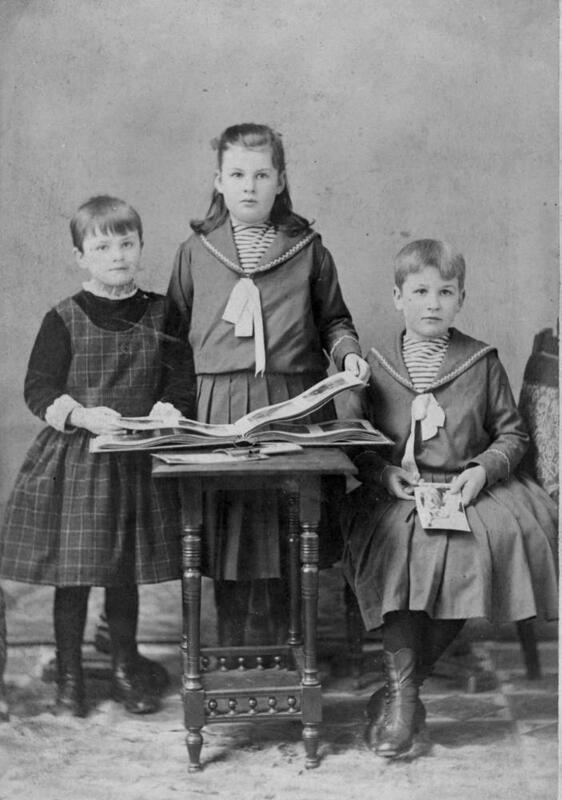 The album in this group portrait appears as a studio prop for this and other group portraits of children marketed by Mrs. R. Maynard. For the original studio album attributed to Mrs. R. Maynard’s Photographic Gallery, see MS-3361. For other Mrs. R. Maynard studio portraits also featuring this album as a studio prop, see HP004426/H-02103 (described as “Charles E. Redfern's children”).